Along our journey of discovery, we meet many people who inspire us, who teach us, who enlighten us as to topics that others consider esoteric. One of Tracing the Tribe’s most interesting encounters years ago was with Dr. Stanley M. Hordes of New Mexico, who specializes in Crypto-Jews of that state. He treats those involved in his research with great dignity and understanding, and his skill in genealogical research and history has enabled many links to be made. San Francisco residents will have an opportunity to hear Stan present “The Sephardic Legacy in New Mexico: A History of the Crypto-Jews,” on Thursday, April 29, at 7.30pm, at the Jewish Community Library. During his tenure as New Mexico State Historian in the 1980s, Stanley Hordes began to hear stories of Hispanics who lit candles on Friday night and abstained from eating pork. Hordes is adjunct research professor at the Latin American and Iberian Institute of the University of New Mexico and a Society for Crypto-Judaic Studies board member. Puzzling over this phenomenon, Hordes realized that these practices might well have been passed down through the centuries from early crypto-Jewish settlers in New Spain. His theory was corroborated after hundreds of interviews and extensive research and led to his award-winning book on the history of the crypto-Jews in New Mexico. Dr. Hordes will talk about the conversos from their Jewish roots and forced conversions in Spain and Portugal to their migration to central Mexico in the 16th and 17th centuries and their part in the colonization of New Mexico. Using slides, he will describe customs and consciousness that have survived to this day, the recent reclamation of Jewish ancestry within the Hispano community, and the challenges of reconstructing the history of a people who tried to leave no traces. 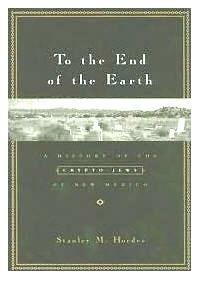 His book (above left) – “To the End of the Earth: A History of the Crypto-Jews of New Mexico” – received the Gaspar Perez de Villagra Prize in 2006 by the Historical Society of New Mexico for outstanding historical publication of the year. If you have not yet read this book, do get a copy. It is a truly fascinating read. He is also working on another book, documenting the same culture in other New World communities. The event is co-sponsored by the San Francisco Bay Area Jewish Genealogical Society, Be’chol Lashon (In Every Tongue) and Lehrhaus Judaica.